A grateful neighbor gave the shoveling husband a pineapple. 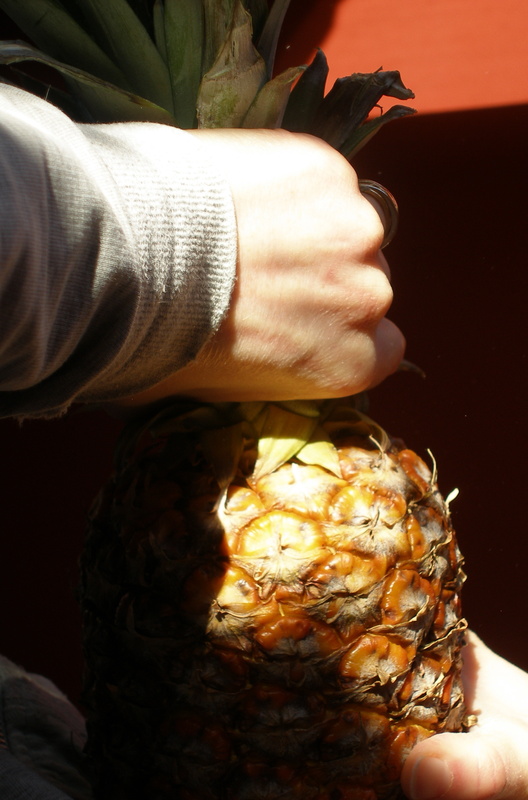 So, while the husband shovels, the wife plays with pineapple. Twenty-seven inches of snow equals one house-bound, stir-crazy gardener. And a lot of shoveling. Thanks to Don’t Throw It, Grow It, an irresistible book picked up in Chicago this past summer, Plants On Deck has a sunny sill full of avocado experiments. Now joining the experimental ranks is a scalped pineapple. If all goes well, we may see a bloom in three years…mark your calendars. 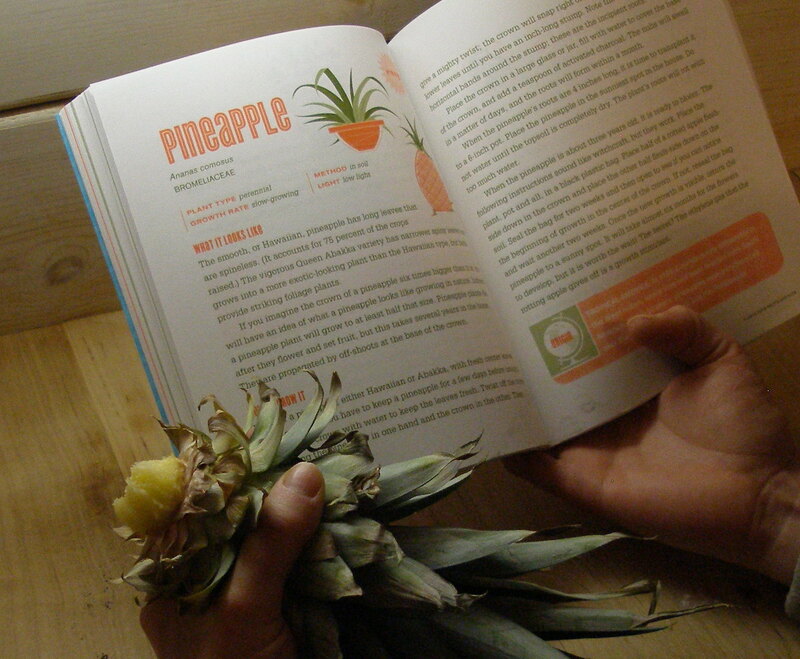 1) Grasp the pineapple firmly with one hand and give the greens a mighty twist with the other hand. 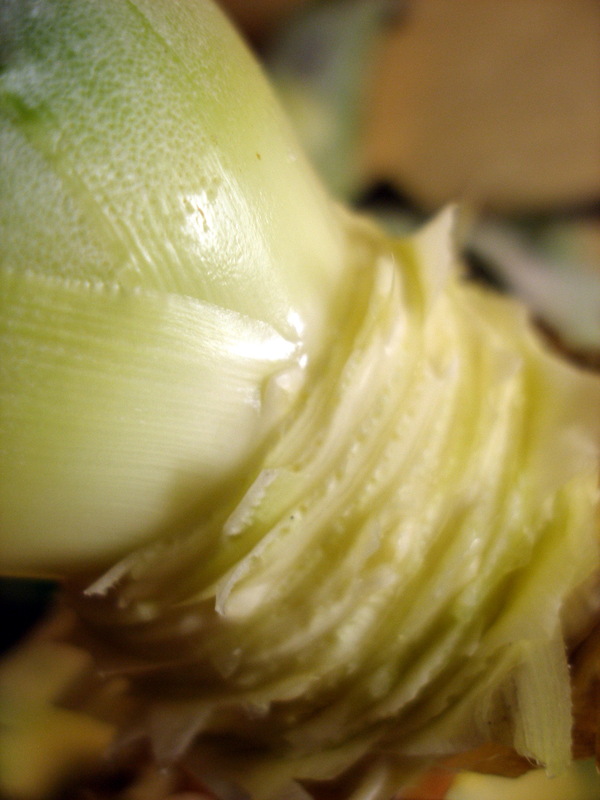 2) Carefully peel the lower leaves off. After an inch or so, you’ll begin to see nubs along the horizontal bands. These nubs will, one hopes, eventually become the roots of your new pineapple plant. 5) Stick the peeled scalp into a jar of water. 6) Add a teaspoon of activated charcoal to the water. Strangely there was no activated charcoal lounging around the house, so the dried contents of a well-used Brita filter will have to do the trick. 6) The nubs should swell in a few days. 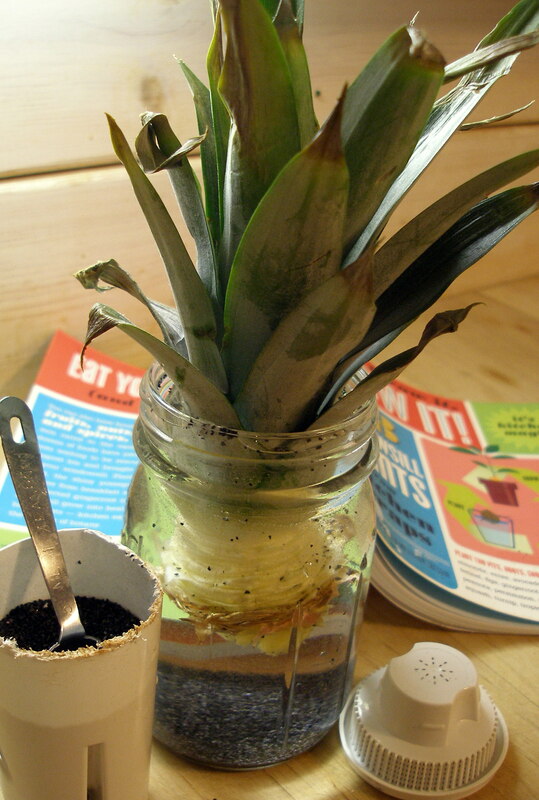 When the roots are about four inches long, transplant the pineapple into a 6″ pot. Obviously, pineapples like sun. Water only when the soil appears completely dry. 7) Are we expecting fresh pineapple? Nah, but if this sucker lives for three years, we’ll see if we can’t force a bloom. Check back in a few years for flowering tips including ethylene gas. Fun stuff! i really, really hope you get a pineapple out of that!